Hot Docs, North America’s largest documentary festival, will present its 24th edition from April 27 to May 7, 2017, presenting over 230 films from across the globe and welcoming hundreds of international filmmakers and industry delegates to Toronto! The Bloor-Yorkville BIA is proud to be a Silver Sponsor and Community Partner of Hot Docs Canadian International Documentary Festival, as the area is a significant hub for the event. Screenings will be held at theatres including the Bloor Hot Docs Cinema, Isabel Bader Theatre, Hart House Theatre, and an Outdoor Screening close-by at Innis College, with First Nations spelling bee film Bee Nation slotted to open Hot Docs fest. 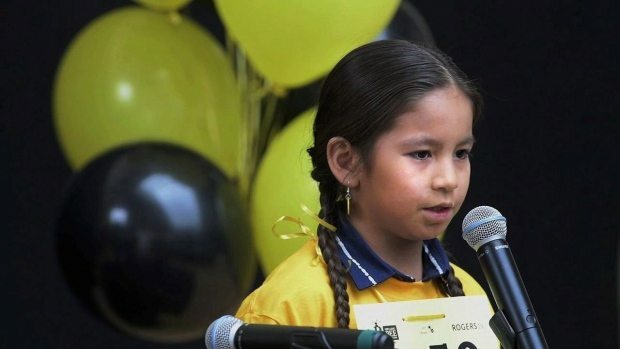 Last March, as Toronto photographer Lana Slezic researched ways to help her eight-year-old son spell better, she heard that the first-ever provincewide First Nations Spelling Bee would be held that month, in Saskatchewan. Just 10 days later, she was on a plane to the province to make a documentary on the inaugural bee and its participants. One year later, and the film has been given the high standard of opening the festival! Bee Nation is one of the many Hot Docs productions created by women filmmakers. In fact, this year`s Hot Docs line-up has an impressive 48 per cent of women directors. The Opening Night Gala Party will be held on Thursday, April 27th at the Royal Ontario Museum with cocktails, an array of delicious cuisine, dancing and the celebration of what’s been called “Canada’s national art form”. Official Hotel Partner and Host Hotel is the Park Hyatt Toronto Yorkville, including filmmaker lounge, VIP accommodation, conference activities and who will also be hosting a Co-Production Luncheon. The Windsor Arms Hotel will be hosting a Doc Mogul Luncheon, and Sassafraz will once again be a Hot Docs Restaurant Partner. Industry Conference and Media Centre: Rogers Industry Centre (Victoria College, 93 Charles Street West) where 2,500+ Industry Delegates visit to pick up registration, network, engage in professional development, and acts as “home base” for the business side of Hot Docs. The Hot Doc Financing Forum will be held at Hart House, and Isabelle Bader Theatre will host the Hot Docs Awards. The Awards Reception will be at the Hot Docs Hub again this year. Hot Docs ticket packages, passes and single tickets are on sale now! Single tickets to screenings are $17 for regular screenings, premium event tickets are on sale for $19-24. Free tickets for all screenings before 5:00 p.m. are available for seniors (60+) and students with valid photo I.D. at the venue box offices on the day of the screening (subject to availability). Passes, packages and tickets can be purchased in person or online at www.hotdocs.ca, by phone at 416-637-5150 or in person at the CraveTV Box Office.